Craig Dearden | Online » Things to do before you pop it. I have to totally applaud the guy who drove his car up Snowdon, yes it might have been irresponsible, he might have had an accident, but he didn’t.. 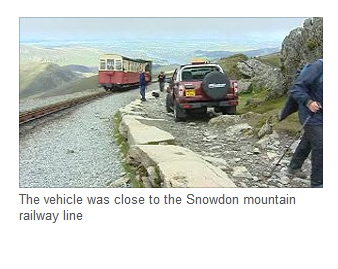 He drove HIS car up a hill.. there’s a railway up there FFS, it’s not as if it’s 20,000m up! His excuse? It was on his list of things to do before he dies. Fair Play. He’ll probably get community service, good on ya dude. Personally I think He was pissed as a fart. Mind you – he would have had to walk down from there at whatever time in the morning he decided to do “it”. AND it was a Frontera! However – it all leads on to those things you want to do before you pop it. But one place I’d like to go before I leave the planet is Rio De Janeiro. The pyramids? hmm – not too sure… if I found some amazing treasure or something, that would be worth it.. so no – it doesn’t make my list. Australia’s Great Barrier Reef? – I don’t think I could go swimming/snorkelling to view it, so it would be a long way to view it from a glass bottom boat, (or however it works). U2 in Dublin, done it, twice. Hong Kong? hmm, now that would be pretty cool, as long as there’s no Tsunami ensuing…. Skydiving? Nope, scared of heights. So there you have it – naff all much I’d like to do (as such…). 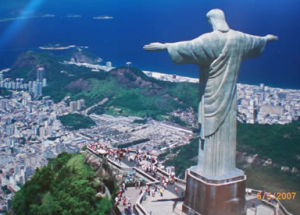 Just take me to Rio. You’ll need a bag carrier & translator for Rio. ….. Just packing my bags…..